There is no busy like back-to-school busy! There’s no crazy like it either!! Right? I cannot believe our first month is already over! I’ve taken down our September bulletin boards and put up our October boards. It is so rewarding to have a blank canvas to begin each month. Dividing the school year into engaging and rich content themes helps in SO many ways. Let’s face it. Looking at the same thing for any stretch of time can get boring. Especially for a kid. Transforming the room each month may take an extra bit of time, but the payoff is in all those “WOW”s when then kiddos first walk in the room after a theme change. Last month we were all about sharing our summer activities, talking about ourselves and grasping a solid hold on what it means to be responsible, be a good friend and follow the golden rule. 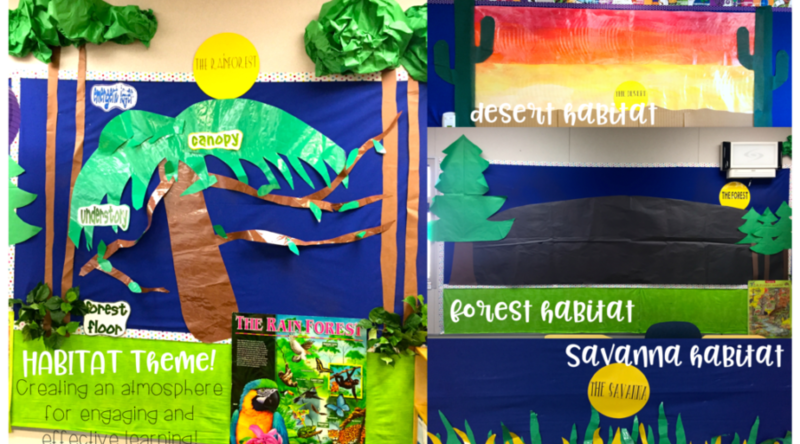 Throughout October the world of plant and animals habitats will be our primary focus. These boards set the stage for engaging content and concept mastery. It is exciting for kids to see their work “living” in these spaces. They also use the bulletin boards as reference during our discussions, collaboration and writing lessons. Nearly everything we work on in class will relate to this concept in some way. As we complete projects and writing assignments, the students’ work will begin to fill these boards and bring them to “life”. Utilizing themes helps build cohesion throughout the day with all of our lessons. The books we read, the text we write and the crafts we make are all related. It is a lot of fun to connect reading for comprehension and finding evidence in text with writing with details that support a main idea. Viewing the standards through the lens of our theme for the month brings it all together. The theme is not only represented on the walls. The focus books in our classroom library center are on the same theme! And I focus on it with my read-alouds. Here are a few on my plans for this week. I like to begin the introduction of habitats with the desert because there are SO many adaptations plants and animals require in order to survive in the desert. My monthly themes focus on our social studies and science standards. This ensures that I cover that content even if time restraints don’t allow me to squeeze in that time block. One of my primary resources for social studies and science is not our old, out-dated, unappealing purchased curriculum. It is Scholastic News. Disclaimer: Scholastic contacted me and asked if I would share how I use their products in my classroom. I’ve used Scholastic News in my classroom for many, many years. They also sent me a few NEW things they now offer that I can not wait to share with you! Although I am receiving compensation for sharing my insights and how I use Scholastic magazines, my views are my own. We ended our friendship and responsibility theme with this Scholastic News magazine. It was a PERFECT end to our September theme and a fantastic lead in to our October theme! How adorable is that?!! The kids just cannot get enough of the fantastic photos Scholastic News provides. This article provided such a great transition for our themes as well! Scholastic News hits several key factors that ensure it is an important and useful learning tool. I love that Scholastic ensures its products are standards based! To keep things teacher friendly, the standards are clearly stated. We have been working on using images to find key details a lot these past few weeks in our ELA curriculum lessons. It is super important to bring those concepts across curriculum in order to gain mastery. Additionally, we do not use most of what we learn in isolation. We use the skills we learn all over the place in our life. So we need to use them all over the place in the classroom. Language arts standards + science or social studies standards = win-win! Because we can write on them, they are current and new, have amazing photos and are filled with text features that are essential for building note-taking and comprehension skills, they are far superior to our outdated curriculum. Sometimes I receive issues that would be perfect for another month. I save them in my cupboard for that month. Moreover, I save at least one issue of all of my Scholastic News magazines. I always order 1 more than I need for my class so I can keep an extra on hand. These are issues from years past. I kept an extra student copy plus the large teacher edition. I display these using my document camera and we work with them together on the white board. The magazines also come with a HUGE teacher copy. These are great for discussing with the class while they are seated on a rug away from tables and desks. They are also great for saving each year. They have helped build my science and social studies content significantly over the years! A WHOLE LOT OF EXTRAS! Each Scholastic News subscription comes with a bunch of extra goodies, too! Scholastic offers downloadable printables with each subscription account. These extend the lesson and continue to help build standard mastery. They are available in Spanish, too! These are the printables my kiddos used with the Furry Friends issue. The activities fit in perfectly with what we were focusing on during our designated ELA block. These photos are of my friend’s 2nd grade classroom. Her students are working collaboratively on a Scholastic News magazine about citizenship. They used one of the printables to graphically address the main idea and key details – a topic they have been discussing during their primary ELA block as well. In fact, there are all kinds of extra goodies on the subscription site. I know a lot of you use Scholastic News in your classroom, but are you utilizing all of the fantastic extras that come with it? The videos are fantastic. The kiddos enjoy playing the educational games, too! The subscription also allows you to go back into the archives and grab previous issues and all of their supports! I just found out about Scholastic Science Readers. Look how awesome these articles are going to be for my unit this month! This is a much thicker magazine with many articles focused on one subject. This one on plants includes articles on function and adaptation – perfect for our science standards. These Science Readers also engage deep thinking with their text, higher-order questions, diagrams and graphic organizers! Below is an image of a tiny portion of this Science Reader about plants. I’m super excited about using these fabulous readers to develop my kiddos reading comprehension and decoding skills while engaging their deep-thinking skills! USE IT IN YOUR CLASSROOM! I highly recommend Scholastic News. It has never disappointed me and it keeps getting better! Scholastic News offers a 30-day FREE trial on their magazines! Seriously – GO CHECK IT OUT! You can subscribe to Scholastic News here. You can subscribe to Scholastic News Science Readers here. **We’ve been fortunate at the schools I’ve worked at to have our Scholastic News magazines purchased for us by our site funds and our PTA over the years. Another great resource in obtaining funds for this purchase is Donor’s Choose. If you don’t already subscribe, check into these avenues to help bring these resources into your classroom. I’m thrilled that Scholastic has offered to give one of my followers a FREE subscription to the winner’s choice of one of the many amazing Scholastic Magazines! Complete the giveaway entry requirements below for a chance to win!! THIS GIVEAWAY IS NOW CLOSED. CONGRATS HEATHER S. 🙂 Thanks to everyone who entered! How do/would you use Scholastic Magazines in your classroom? I’d love to hear. Leave a comment! !